Toast the coriander and caraway till fragrant. 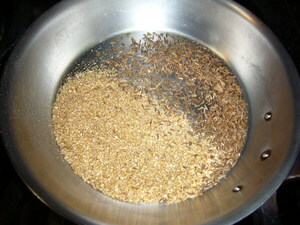 Finely grind the coriander and caraway. Add some oil to a 5qt saucepan. 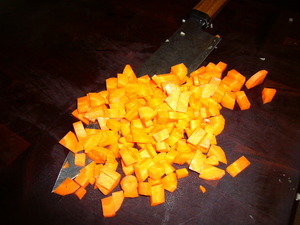 Heat to medium and add onions and carrot. Saute till soft, around 10 minutes. 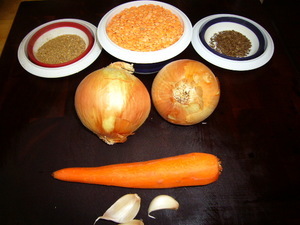 Add the coriander, caraway, and garlic to the onions. Cook for about 2 minutes. Add stock and lentils. Bring stock to a boil. Cover, and simmer for about 20 minutes or until lentils are done. 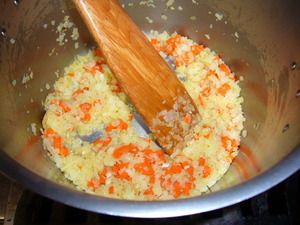 Puree the soup and adjust seasonings. Mix the yogurt and 3/4 of the mint. 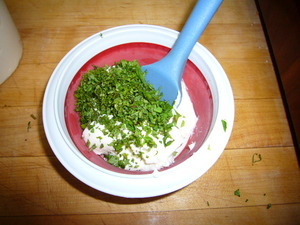 Serve the soup with a dollop of the yogurt in the center and sprinkle with some more mint.